To some, March represents the last month of winter, and a relaxing spring break spent in warmer climates. But to others, March is an exciting month focused entirely on basketball. The annual mania that takes over sports media and fans everywhere drives groups indoors to consume hours of televised games and a wide array of delightful food. And why not? The NCAA March Madness basketball tournament provides an excuse for gathering at all hours of the day to cheer on our teams’ successes and wallow in their defeats. And what better way to celebrate at these gatherings than with an amazing spread? 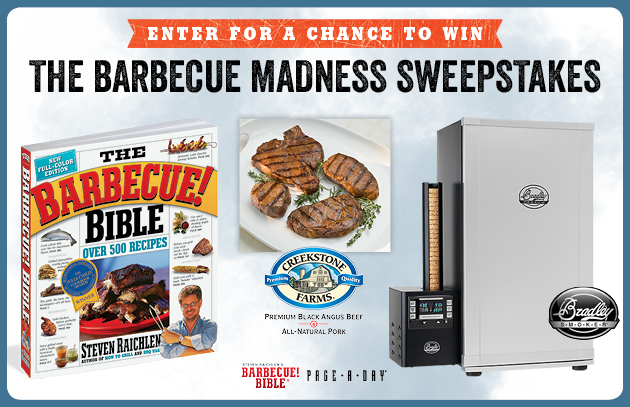 With our friends at Bradley Smokers and Creekstone Farms, we are proud to bring to you the Barbecue Madness Sweepstakes! From now through March 31, 2017, enter below for a chance to win a Digital Smoker from Bradley, and high quality steak and brisket from Creekstone Farms! Use your email address or log in with Facebook to complete your entry. NO PURCHASE NECESSARY. Open to US residents of the 48 Continental United States, age 18 years as of March 31, 2017. Sweepstakes begins at 12:00 a.m. Eastern Time (ET) on 3/1/2017 and ends at 11:59 p.m. ET on 3/31/2017. Click here for official rules. Void where prohibited.